The thirteen (13) trial lawyers at DLP continue to investigate a gas truck, motorcycle accident in Bradford County Pennsylvania which resulted in serious injury to the firm’s client. Attorneys Joe Price and Paul Oven are leading the investigation. This case is one of many catastrophic injury and death cases being handled by DLP in the Marcellus shale region of Northeastern and Central Pennsylvania. Dougherty Leventhal & Price, DLP, notes that partner John Finnerty is investigating a death which occured at the Veteran’s Medical Center. Attorney Finnerty has retained experts to assist his clients. Attorney Finnerty is one of twelve lawyers at DLP–Pennsylvania Truck Accident Lawyers—handling serious injury cases throughout Northeastern and Central Pennsylvania. Attorney Finnerty along with Attorneys Cal Leventhal and Tom Cummings handle Pennsylvania Workers Compensation cases in the Marcellus Shale Gas Counties including Bradford, Sullivan, Wyoming, Susquehanna, Potter, Tioga and Lycoming. 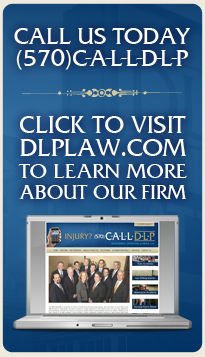 DLP–PENNSYLVANIA TRUCK ACCIDENT LAWYERS.